For the past 50 years—since the discovery of a thousand-year-old Viking way station in Newfoundland—archaeologists and amateur historians have combed North America's east coast searching for traces of Viking visitors. 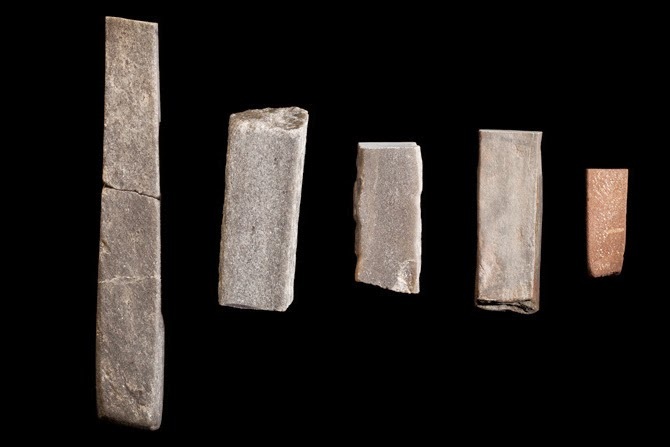 While digging in the ruins of a centuries-old building on Baffin Island (map), far above the Arctic Circle, a team led by Sutherland, adjunct professor of archaeology at Memorial University in Newfoundland and a research fellow at the University of Aberdeen in Scotland, found some very intriguing whetstones. Wear grooves in the blade-sharpening tools bear traces of copper alloys such as bronze—materials known to have been made by Viking metalsmiths but unknown among the Arctic's native inhabitants. Taken together with her earlier discoveries, Sutherland's new findings further strengthen the case for a Viking camp on Baffin Island. "While her evidence was compelling before, I find it convincing now," said James Tuck, professor emeritus of archaeology, also at Memorial University. 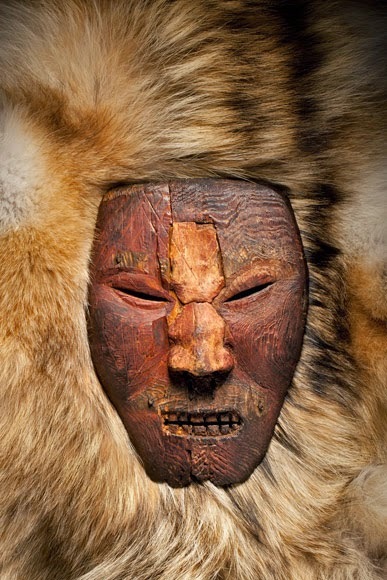 Photograph by David Coventry All artifacts Collection Canadian Museum of Civilization New clues suggest that the ancient Americans who carved this fierce mask may have dealt with Viking explorers on friendly terms. Archaeologists have long known that Viking seafarers set sail for the New World around A.D. 1000. A popular Icelandic saga tells of the exploits of Leif Eriksson, a Viking chieftain from Greenland who sailed westward to seek his fortune. According to the saga, Eriksson stopped long enough on Baffin Island to walk the coast—named Helluland, an Old Norse word meaning "stone-slab land"—before heading south to a place he called Vinland. 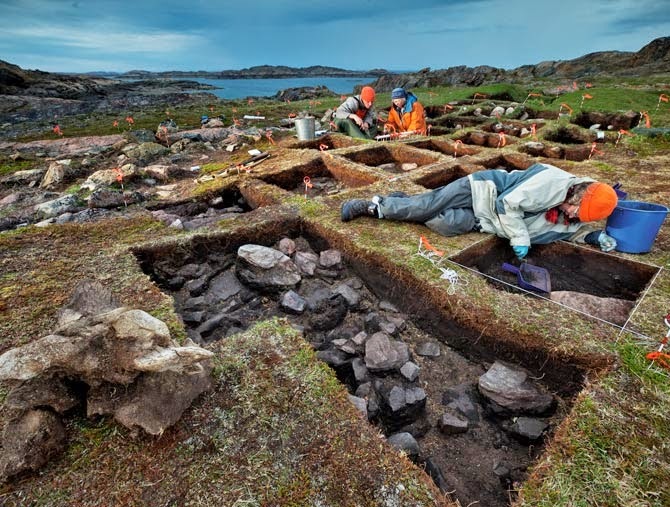 In the 1960s two Norwegian researchers, Helge Ingstad and Anne Stine Ingstad, discovered and excavated the Viking base camp at L'Anse aux Meadows (map) on the northern tip of Newfoundland—the first confirmed Viking outpost in the Americas. Dated to between 989 and 1020, the camp boasted three Viking halls, as well as an assortment of huts for weaving, ironworking, and ship repair. 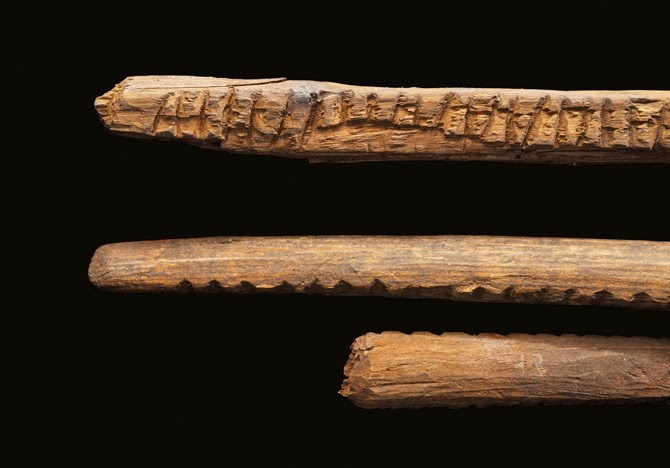 As reported in the November issue of National Geographic magazine, Sutherland first caught wind of another possible Viking way station in 1999, when she spotted two unusual pieces of cord that had been excavated from a Baffin Island site by an earlier archaeologist and stored at the Canadian Museum of Civilization in Gatineau, Quebec. Sutherland noticed that the strands bore little resemblance to the animal sinew Arctic hunters twisted into cordage. The cords turned out to be expertly woven Viking yarn, identical in technique to yarn produced by Viking women living in Greenland in the 14th century. Photograph by David Coventry, Viking Ship Museum, Roskilde, Denmark Daring Viking seafarers used ships like this modern replica to reach the New World in their search for furs, walrus ivory, and trading partners—which they may have found in the native Dorset people. The discovery prompted Sutherland to scour other museum collections for more Viking artifacts from Baffin Island and other sites. She found more pieces of Viking yarn and a small trove of previously overlooked Viking gear, from wooden tally sticks for recording trade transactions to dozens of Viking whetstones. The artifacts came from four sites, ranging from northern Baffin Island to northern Labrador, a distance of a thousand miles (1,600 kilometers). Indigenous Arctic hunters known as the Dorset people had camped at each of the sites, raising the possibility that they had made friendly contact with the Vikings. Photograph by David Coventry Unearthing what she believes to be a Viking outpost, archaeologist Patricia Sutherland (in orange jacket) and her colleagues work in Baffin Island’s Tanfield Valley, which offered turf for sod shelters and a harbor for ships. Intrigued, Sutherland decided to reopen excavations at the most promising site, a place known as Tanfield Valley on the southeast coast of Baffin Island. In the 1960s U.S. archaeologist Moreau Maxwell had excavated parts of a stone-and-sod building there, describing it as "very difficult to interpret." Sutherland suspected that Viking seafarers had built the structure. Since 2001 Sutherland's team has been exploring Tanfield Valley and carefully excavating surviving parts of the mysterious ruins. They have discovered a wide range of evidence pointing to the presence of Viking seafarers: pelt fragments from Old World rats; a whalebone shovel similar to those used by Viking settlers in Greenland to cut sod; large stones that appear to have been cut and shaped by someone familiar with European stone masonry; and more Viking yarn and whetstones. And the stone ruins bear a striking resemblance to some Viking buildings in Greenland. Photograph by David Coventry Did Vikings use these notched sticks to record trade transactions? Patricia Sutherland thinks so. Still, some Arctic researchers remained skeptical. Most of the radiocarbon dates obtained by earlier archaeologists had suggested that Tanfield Valley was inhabited long before Vikings arrived in the New World. But as Sutherland points out, the complex site shows evidence of several occupations, and one of the radiocarbon dates indicates that the valley was occupied in the 14th century, when Viking settlers were farming along the coast of nearby Greenland. In search of other clues to help solve the mystery, Sutherland turned to the Geological Survey of Canada. Using a technique known as energy dispersive spectroscopy, the team examined the wear grooves on more than 20 whetstones from Tanfield Valley and other sites. Sutherland and her colleagues detected microscopic streaks of bronze, brass, and smelted iron—clear evidence of European metallurgy, which she presented October 7 at a meeting of the Council for Northeast Historical Archaeology in St. John's, Canada. 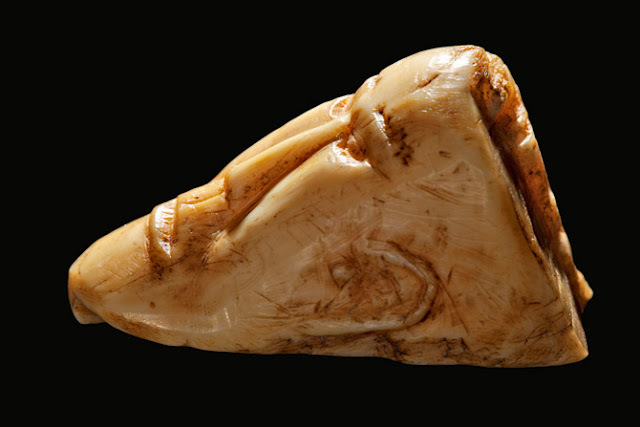 Photograph by David Coventry Skillfully working walrus ivory, Dorset artists portrayed the mysteries and wonders of their remote Arctic world, from wandering polar bears (next photo) to what may be the face of a European visitor (above). Sutherland speculates that parties of Viking seafarers travelled to the Canadian Arctic to search for valuable resources. In northern Europe at the time, medieval nobles prized walrus ivory, soft Arctic furs, and other northern luxuries—and Dorset hunters and trappers could readily stockpile such products. Helluland's waters teemed with walruses, and its coasts abounded in Arctic foxes and other small fur-bearing animals. To barter for such goods, Viking traders likely offered bits of iron and pieces of wood that could be carved into figurines and other goods, Sutherland says. 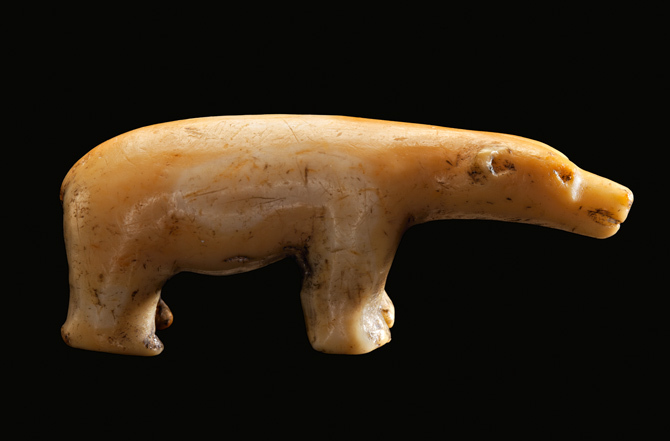 Photograph by David Coventry Walrus ivory was turned into this polar bear. If Sutherland is correct, the lines of evidence she has uncovered may point to a previously unknown chapter in New World history in which Viking seafarers and Native American hunters were partners together in a transatlantic trade network. "I think things were a lot more complex in this part of the world than most people assumed," Sutherland said. James Tuck agreed. "It's pretty convincing that there was a much larger Norse presence in the Canadian Arctic than any of us thought." Photograph by David Coventry Whetstones discovered on Baffin Island and at other sites in the Canadian Arctic bear clear evidence of Viking technology. 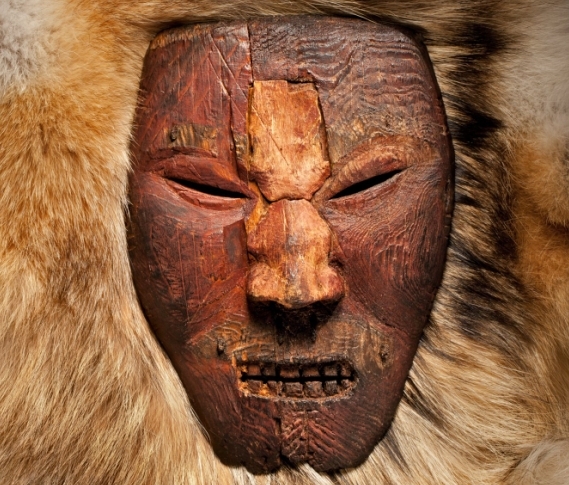 Wear grooves harbor traces of bronze, brass, and smelted iron—materials made by Viking metalsmiths but unknown among the Arctic's native inhabitants. Responses to "Evidence of Viking Outpost Found in Canada (Photos)"
Human beings have no memory. No such a thing as collective memory. Too sad! Things were far.more complex than anyone will ever know everywhere around the world. Until we can time travel we wont know because we have no memory, and there is only so much archaeologists can survey, only so much we can trace back and map out. There is a lot that we don't know. I find this intriguing but I am not surprised. For me is normal ancient trade, like in southern coasts of Norway and Sweden,we know that viking were powerful warriors and skillful traders! It seems perfectly logical a seafaring race, with experience of crossing open seas, at a time when the northern climate was milder, should land hop from Iceland to the eastern coast of North America. The Viking explorers likely had more in common with the indigenous people of the area than the Spanish who arrived 400 years later. Not surprised, i don't believe we know very much at all, about our Norse ancestors. I have been serching for evidense of Viking settlement, along the river Alt, in Merseyside UK, for the past 30 years. I believe there is a link between Manx Vikings, North American vikings and the area i have been serching between River Ribble and River Mersey. The river flows through ancient peat bog. I have recentley found a bog iron fernace. With clay,soapstone, molds. Interesting but not suprising. 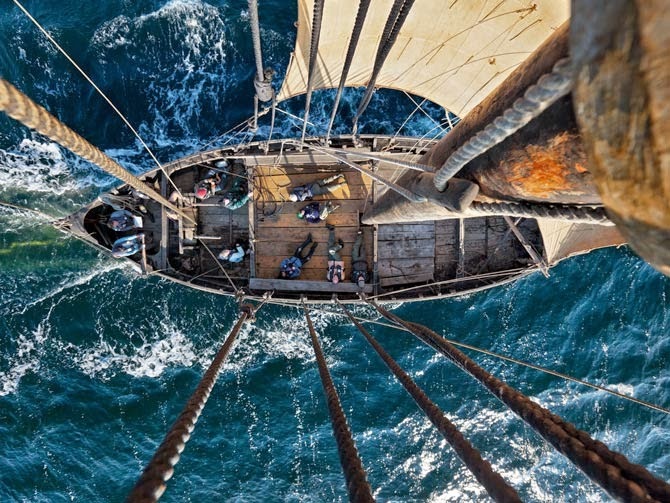 Vikings were daring seafarers. As were the Olynesians. It would n't surprise me if one day scientists find prove of Polynesians visiting the west coast of America. One correcction though; Leif Ericsson was NOT a greenlander. He was a Norse leader exiled from Norway due to a dispute at home (Norway). Others think there were Norse Pre-Viking people in North America looking for cooper way before Viking times. Being half Swedish and nearly a third Cherokee this is neat to read. Both ancestors coming together. What about the Ruinstones with writings from an island off the coast of Sweden? Love learning new things about history, and yes I too think it is time to drop Columbus Day!!!!! I was at Vancouver's MoA looking at archived items from the Sami people of Northern Scandinavia, and noticed their boots looked so much like mukluks from the Quebec/ Ontario tribes, right down to the same colours of beads and very similar patterns. I would never have been able to tell the difference myself. Very glad to see that Jim Tuck is still actively involved in site work. I was an archaeology student of his many moons ago. Also, as part Mi'kmaw, I agree with Sonderstron that it is time to drop Columbus Day in favour of Indigenous Day or some such (although I realize the woodlands Mi'kmaq were no more closely related to the Arctic Dorset than were the Cherokee or any other "Indian" tribe further south). One of the tools used to establish Viking contact is to search for the bog iron nails used in the construction of Knorrs. These nails have been found in several Baffin Island sites and farther north. So it seems to me that the question is not were the vikings there but did they establish a trading presence on land. Leif was never exiled from anywhere. Well Norway was under Danish rule for most of the viking era according to a lot of sagas. Could someone please explain to the journalists that there is a difference between "woven" and "spun" when it comes to textiles and especially cordage? These are very specific terms, and a piece of thread *might* have come from woven cloth, but on its own, as a strand of yarn, one could not, in a month of Sundays, know that it was woven, expertly or not. If its a piece of finely spun yarn/thread, that's really interesting, though. Honestly, Sabina! Reread your history! First, there was no real Danmark nor Norway. Second; the dannes newer ruled Norway during the viking era! I live in the region of England that was a Norse Kingdom [the Danelaw], absorbing several small Anglo-Saxon kingdoms. Earlier my area was raided extensively by Vikings from Norway but they did not settle because of fierce resistance from the Anglo-Saxons. To Selma: We do have collective memories, but all those memories were hand down as a form of story or myth, legend. Later these memories were written down as record, but unfortunately there was systematic of removal of these memories and documents, by execution and burning, even if these memories does survived til today, mainstream will ridicule, dismiss it or debunk it, we are so condition NOT to believe our culture's myth and stories or legend, how do we expect to have collective memories? For one good example, there is a creation myth documented in ancient time call Enuma Elish, in there there is a story about how Enki create human with his sister Ninhursag (also known as Ninmah https://en.wikipedia.org/wiki/Enki). There also a story very much parallel to this in ancient China, the story of Nüwa created first human (https://en.wikipedia.org/wiki/N%C3%BCwa), Nüwa also know as Nügua, did you notice the name of Ninmah and Nügua actually very similar? The most stunning is the depiction of this figure of Nügua, she always depicted as a human upper torso with a snake lower part, she always depicted coil her lower body with her husband 伏羲 Fuxi, and there is ALWAYS a peculiar instrument holding in one of their hand, a compass in Nügua's hand and a right angle ruler in Fuxi's hand. If that is not a collective memories, I don't know what it is, but the question is - do we accept it as a collective memories or we will dismiss it as a fantasy story made up by our ancestors to fool us. There is currently very reasonable discussion, championed by the ex-head of the Smithsonian, suggesting that Solutreans circumnavigated the Atlantic during the middle of the last ice age. Perhaps even giving rise to the Clovis points. Not sold on this theory yet but the is a convincing conference paper posted on You tube. Long but fascinating.